Lucky me, I was in New York over the weekend to celebrate my mother's birthday. Though we were staying downtown, she really wanted to do lunch at an old favorite Upper East side French restaurant, so we battled our way there through the rain and traffic. I was secretly wishing we could have stayed closer to home (or Balthazar)--until we sat down to eat. Everything about lunch was grand, from the glass (and a half!) 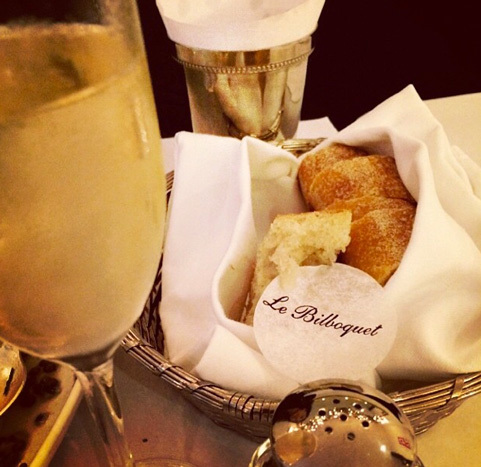 of champagne to the creme brulee to the basket of bread and salted butter in between. And, of course: elegantly-attired diners everywhere. Men and women, young and old, decked out in sophisticated Upper East Side-meets-Euro classics: cashmere sweaters, generously oversize coats, tailored blazers, delicate silk blouses, etc. The glamorous scene made me want to add more of these refined, always-chic pieces to my wardrobe, wear-again-and-again staples like this feminine lace-trimmed Valentino sweater (40% off), this sleek and neutral Alexander Wang coat (40% off) this glinty (Chanel-ish) crochet metallic cardigan by Topshop (which I bought post-lunch! ), this classic Chloe leather tote (40% off), this tweed Isabel Marant jacket (40% off), this lavish parfait of a Jimmy Choo clutch (35% off), this dashing Zara cape, and this polished Elizabeth and James button-down blouse (60% off). Sounds lovely...not for everyday but here in LA we have nothing like it. Love the little Topshop cardi. Could you please share what size you got? I cant decide between a small or medium and I am about the same size as you. Love your blob btw. I bought the Topshop cardigan in a medium. It's truly stunning--great over a white blouse or an evening dress. Your jaw will drop, I swear! I live in NYC and LOVE Le Bibloquet. I used to go to their old location and stayed loyal once they moved. So glad you enjoyed it as well! Hi, did you buy the Topshop cardigan in a medium because you prefer it a little looser? you surely must be a small size. I'm wondering whether to purchase a size up? Thank you. I am a size 6, so the medium allows me layer it over blouses, etc.